The NorthWest Seminar Group of the Trollope Society will be discussing The Eustace Diamonds on Thursday 1st May. The discussion will be introduced by Sandra Grant and will focus on the second half of the novel. The discussion will take place at the Friends’ Meeting House in Manchester, which is behind the Manchester Central Library. It will be at 6pm for 6:30pm. For more information about the discussion and details of the Seminar Group, please contact Jean Ammar (email: j.ammar@hotmail.co.uk ). 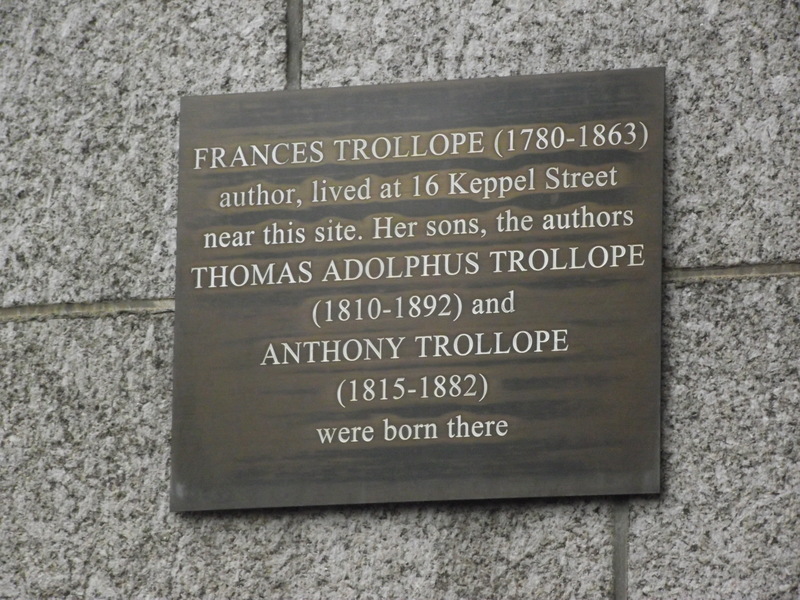 The Trollope Society organised a guided walk through London’s Bloomsbury district taking in key sites from Trollope’s novels and life. Incidentally, Keppel Street is also the site of the house where Anthony was born. From there the walk took in the Georgian splendour of Bedford Square where Lady Anna was temporarily housed in the safekeeping of Serjeant Bluestone before reaching Great Russell Street where Lady Anna went to her lover in his lodgings. The walk ended on Chancery Lane at the entrance to Lincoln’s Inn where Anthony spent unhappy hours of his childhood in the chambers of his father at number 23 Old Square, which he described as “dingy, almost suicidal”.